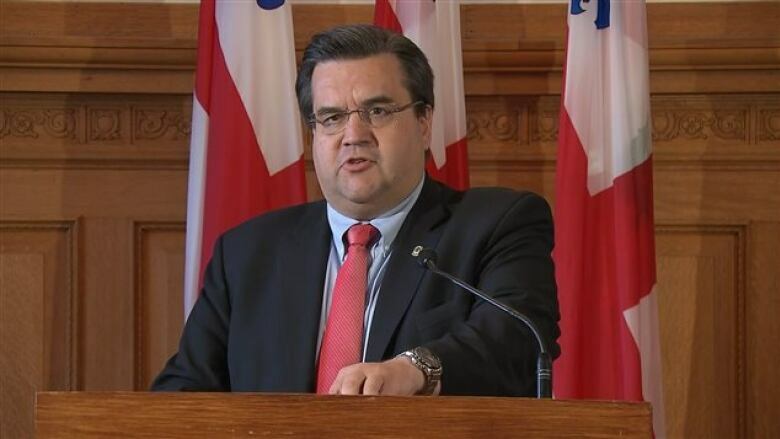 Montreal Mayor Denis Coderre’s security has been heightened in light of the ongoing conflict over Bill 3’s proposed changes to municipal workers’ pension plans. The mayor’s security is now being handled by the Montreal police force, Radio-Canada has learned. Montreal police refused to give the details about police personnel surrounding the mayor. According to information obtained by Radio-Canada, the police are following Coderre during his travels, and the number of officers varies depending on the events the mayor attends. Normally, the mayor of Montreal is accompanied by a driver. Since Aug. 18, when hundreds of city workers protested outside Montreal City Hall and stormed the building, heightened security measures have been in place. During last night’s council meeting, a significant number of police officers — uniformed and civilian — were stationed around City Hall and the SWAT team was also on site. Montreal police would not say whether other elected officials have had their security increased.